Our inspiration for the Little People™ Apptivity™ Barnyard came from watching young children play with apps and toys. They didn’t view the world as “digital” vs. “physical” but rather moved fluidly between both modalities and even used them together. We therefore set out to reinvent our classic farm playset to reflect how children naturally want to play. 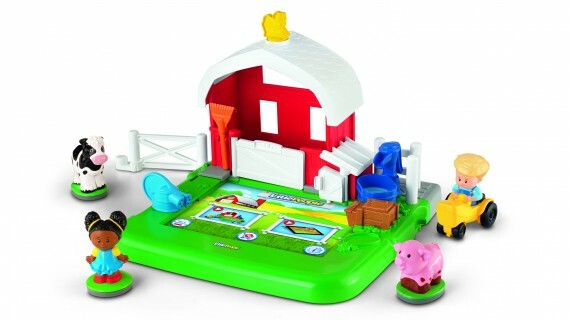 The Little People Apptivity Barnyard represents a new level of interactivity, where the app and toy are fully integrated and augment each other. The app provides a rich, living world while the conductive playset and figures provide a new, tangible way to explore this world. Everything works with everything else, just as children expect! We also wanted an interactive experience that would invite children to use their imagination rather than replace it. So we designed the play to be largely open-ended and based on themes that they are familiar with. Children can explore at their own pace, without a wrong way to do things. The playset becomes what children want it to be, limited only by their imagination. The Little People Apptivity Barnyard, therefore, reinvents playset play for the 21st century, bringing delight to a new generation while retaining a focus on imagination. The Little People Apptivity Barnyard takes into consideration how play develops in early childhood. For eighteen-month-olds, whose play is largely cause-effect, we built a rich world that they can readily explore and discover. For two-year-olds, whose pretend play is centered on everyday experiences, we added opportunities for them to act out familiar routines like feeding and bathing. For preschoolers now immersed in imaginative play, we included occasional, undirected play prompts (e.g., “Where does Eddie want to go today?”) and mini-activities. Thus, this playset experience evolves as children grow. Young children are also starting to develop a sense of humor and especially find delight in the unexpected. So we built in lots of surprises for them to gradually discover as they explore. Finally, the interaction is intuitive enough for toddlers to have immediate success. Simply touch the screen with a conductive toy or your finger to elicit a unique, special reaction and a subsequent sense of accomplishment and pride. The Little People Apptivity Barnyard can be experienced as app + toy, as app alone, or just the toy itself. It is also great with parents as a joint play experience yet it’s easy enough for children to play with by themselves. To assess impact, we iteratively put the Little People Apptivity Barnyard in homes during development. Parents reported that the rich physical and digital interaction enhanced their children’s enjoyment. We were excited to learn that children extended their play beyond the product. They brought other toys to the barnyard and continued their imaginative farm play away from it. Some even became interested in planting their own gardens. Thus, the Little People Apptivity Barnyard was interactive in a broader way than anticipated. Parents appreciated that the Little People Apptivity Barnyard allowed their children to be self-expressive and was easy to use. They especially liked that their children had fun and wanted to play with it over and over! The Little People Apptivity Barnyard also offers a nostalgic reminder of parents’ own childhood, but with a modern twist. Its durability and screen protection helps them feel secure in giving their iPad® to their children. Finally, the Little People Apptivity Barnyard paves our company’s path into the new app + toy category in a way true to our playset heritage while on trend with children’s growing use of smart devices. In doing so, it embraces our value of putting children’s needs first throughout design. Children are at the core of our design process. Upfront, we observed them play with ad-hoc models using parts from existing Little People products, farm toys and apps. This led to our initial concept and inclusion of the horizontal digital play surface, conductive tools, and themes like nurturing, feeding and gardening. Further iterative testing led to additional features, such as the design of the conductive character base that accommodates the identification of each while minimizing unintended touches of the screen. We even added unexpected things children wanted to do with our models into the play experience (e.g., the graphical label hidden inside the toy baby door). Equally important was incorporating past learnings from making playsets and Kid-Tough® smart device cases. We knew the interactive experience needed to invite children to use their imagination. Therefore, we created layers of play, where children can explore and imagine based on their developmental stage. At the same time, the toy is durable and screen protected so parents feel secure allowing their children to use their iPad. Finally, we included a gate that connects the Apptivity Barnyard to our other Little People playsets, encouraging children to extend their imaginative play across more of their world.